And brioche! I got it in my head to bake the brioche for this week’s Sweet Melissa Sundays selection, Sweet Almond Bread Pudding with Raspberry Sauce. 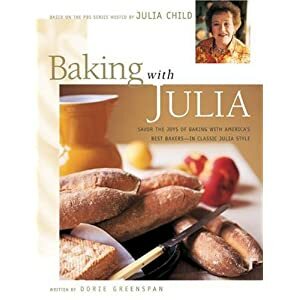 I’ve made brioche before, both the one from Dorie Greenspan’s Baking…From My Home to Yours and from Peter Reinhart’s The Bread Baker’s Apprentice. This time I decided to try the brioche recipe from Elisabeth Prueitt’s Tartine. As Tartine recipes tend to go, it was a fussy recipe requiring a pre-ferment, both freezer & refrigerator time, and washing lots of dishes. And as Tartine recipes tend to go, it was the best recipe I’ve made. The crumb was unbelievable and the bread was gorgeous. I made the full recipe which yielded 2 loaves and 12 petite brioche sans tête (didn’t feel like adding the têtes). In the introduction to the recipe Elisabeth Prueitt suggests using slices of brioche for tartines, French open-faced sandwiches. I thought that was a swell idea and made one using leftover toppings from my pizza party. It’s a 4-Cheese tartine with sun-dried tomatoes and red onions. Most of the brioche is residing in my freezer for French toast emergencies. I only made a 1/4 of the Sweet Melissa recipe because I’m not a fan of bread pudding. I made 1/2 of the raspberry sauce because it will be great on ice cream. Thank you to Candace of Candy Girl for hosting this week. 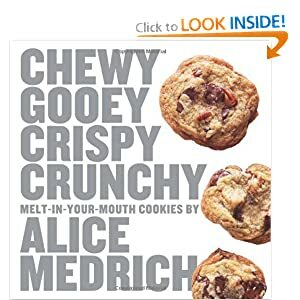 If you would like the recipe, visit her blog or buy the book–Melissa Murphy’s The Sweet Melissa Baking Book. After a long hiatus, I’ve remembered to submit this to Yeastspotting! 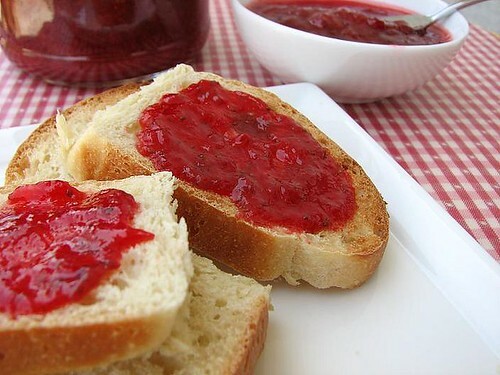 This week’s Sweet Melissa Sundays recipe selection, Strawberry-Rube Grapefruit Preserves, was fun and easy to make. 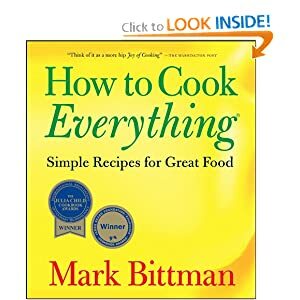 You just throw in all the ingredients (strawberries, grapefruit juice & zest, sugar, apple) in a pot, boil, and let it reduce into sweet goodness. I made a 1/2 recipe and it still made a lot. One big pickle jar full. It’s been perfect on toast and wonderful with plain yogurt and granola. I think it would also be good in a baked item, but haven’t made anything yet. 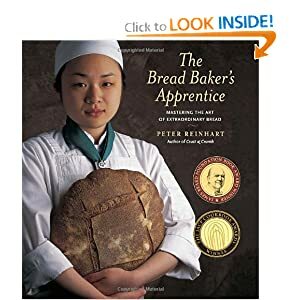 Thank you to Margot of Effort to Deliciousness for this week’s pick as we bake through the book. If you would like the recipe, please visit her BLOG. Apparently, in addition to her film accomplishments, Katharine Hepburn was known for her brownies. I did not know this. After imdb-ing her, I’ve also realized that I’ve never watched one of her movies. The closest I’ve come to “watching” her in a movie is seeing Cate Blanchett play her in The Aviator. I really need to catch up on my classic movie watching. This week’s Tuesdays with Dorie recipe, A Tribute to Katharine Hepburn Brownies, is Dorie Greenspan’s tribute to the famous brownies. 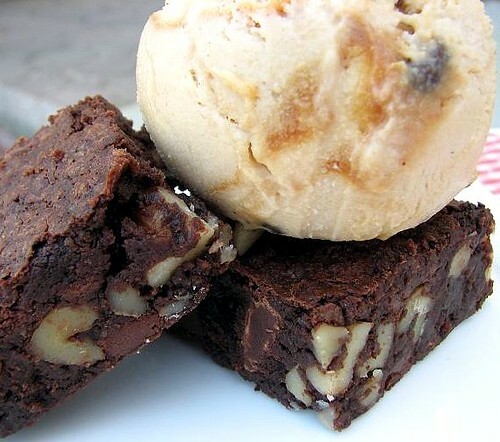 My tribute to the brownies is ice cream. 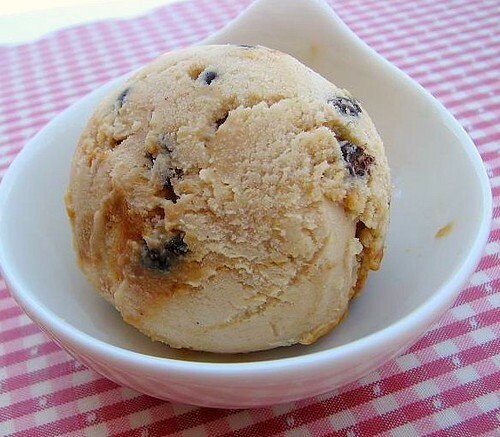 More specifically, Peanut Butter Ice Cream with a Caramel Swirl and Chocolate-Covered Cacao Nibs. 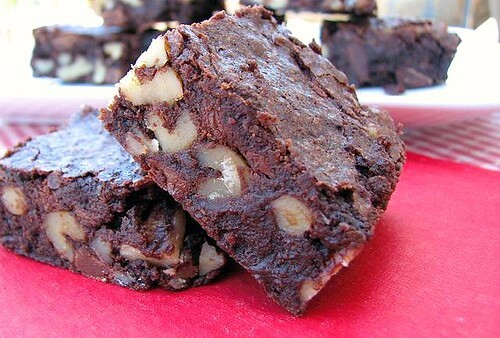 The brownies had just the right amount of gooey-factor and were fudgey with a hint of cinnamon. Loved them. Co-workers loved them. But the ice cream, yes the ice cream was an absolute dream. This is my new favorite flavor. 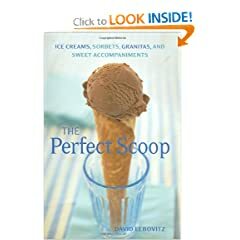 I made Peanut Butter Ice Cream from The Perfect Scoop and swirled in Creamy Caramel Sauce also from the book and I also added in some chocolate-covered cacao nibs. You can find the recipe for the ice cream HERE. I need to figure out how to successfully bring ice cream to work. I was thinking about buying dry ice. 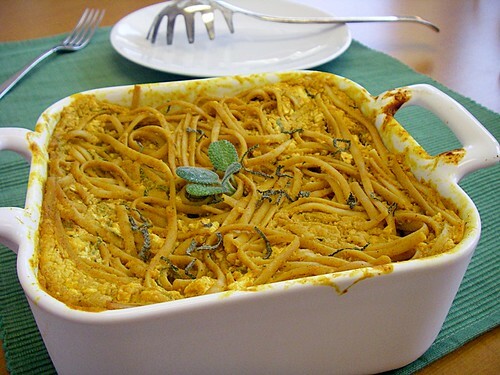 Thank you to Lisa of Surviving Oz for selecting this week’s recipe. She isn’t a member of Tuesdays with Dorie, but designed the new logo. Isn’t it cool? 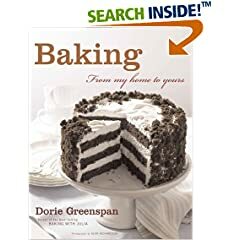 If you would the recipe, either buy Dorie Greenspan’s Baking… From My Home to Yours or visit Lisa’s blog. When Dorie Greenspan writes in a recipe’s introduction that this is something the French frequently make in their home kitchens, you know the dessert will be a breeze to make. Apparently the French don’t do complicated at home, Why would they need to when there is an amazing pâtisserie on every block? This week’s Tuesday with Dorie selection was the French Yogurt Cake with Marmalade Glaze. And yes it was a breeze to make. For one thing, there is no butter and therefore no need to wait for it to come to room temperature. For another, there is no beating things until they hold firm peaks or are creamy. I don’t know if it was because it was too easy or I’m just used to complicated, but I decided to up the complication level. I made the full-recipe cake as directed–using Fage Total Yogurt because it’s the type of yogurt I prefer to eat–, added a bit of lemon oil to up the lemon flavor, and baked it in a 9″ round pan as suggested in a Playing Around suggestion. The cake baked up perfectly and beautiful. I glazed the cake using lemon-pear marmalade because I couldn’t find plain lemon marmalade. I then split the cake in half to create two layers and used a biscuit cutter to create layers for cakelets. I layered some of the cakelets with a Crushed Strawberry Sauce I made based off a recipe from the April 2009 issue of bon appétit. Some of the cakelets were layered with Dorie’s Lemon Curd I made specifically for this recipe. The final group of cakelets were layered with almond pastry filling and chocolate shavings, left over from another pastry I made this weekend. I topped all cakelets with a dollap of whipped cream. For the almond ones, I sprinkled the tops with more chocolate shavings and sliced almonds. I topped the lemon cakelets with candied lemon slices leftover from last week’s TWD and the strawberry cakelets were topped with more crushed strawberry sauce. The cakelets were out-of-this-world delicious. The cake was very moist and full of flavor. My favorite was the strawberry cakelet. Thank you to Liliana of My Cookbook Addiction for choosing the French Yogurt Cake. Please visit her blog for the recipe. Note: The original recipe is for blueberries. 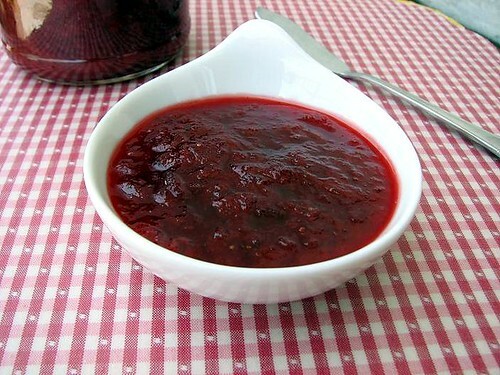 Combine half of the strawberries (7 ounces) and the rest of the ingredients in a heavy-bottom sauce pan. Stir over medium heat until the sugar is dissolved and mixture begins to simmer. 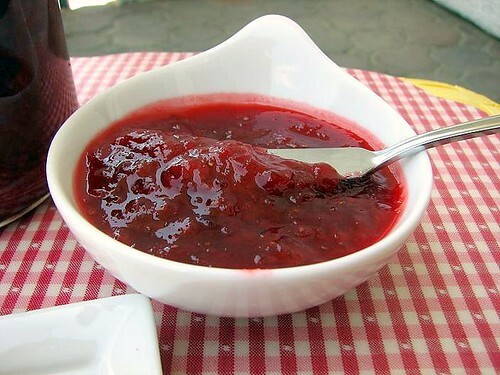 Reduce heat and simmer until strawberries are very soft and liquid is syrupy, approximately 7 minutes. Remove from heat and add remaining strawberries, lightly pressing the fresh strawberries on the side of the pan until they are lightly crushed.